Night-time rainbows? That's right. These very rare phenomena are called (what else?) moonbows – and one just recently appeared in the skies over Iceland. Photographer Víðir Björnsson spotted the rare display while driving in heavy rain near the small town of Stykkisholmur. "I just stopped the car because I could not believe what I was seeing. First I thought I was just seeing some reflection from the window of my car, but then me and my friend who was driving decided to stop and try to get a picture of it," he tells BBC News. In a nutshell, moonbows form in much the same way rainbows do, but as their name suggests, they emerge at night when moonlight shines on water droplets. But that's just the start – conditions need to be just right before you'll see one appear in the night sky. "Moonbows are rare because moonlight is not very bright," explains Les Cowley, an expert in atmospheric optics. "A bright moon near to full is needed, it must be raining opposite the moon, the sky must be dark and the moon must be less than 42° high." It's no surprise, then, that moonbows tend to appear more frequently in certain spots around the world where these conditions are more likely to line up. Because they're so faint, they often appear white to the human eye – but the colours come to life in long-exposure photographs. This one, captured by photographer Alan Stark, rose over the Arizona mining town of Jerome. 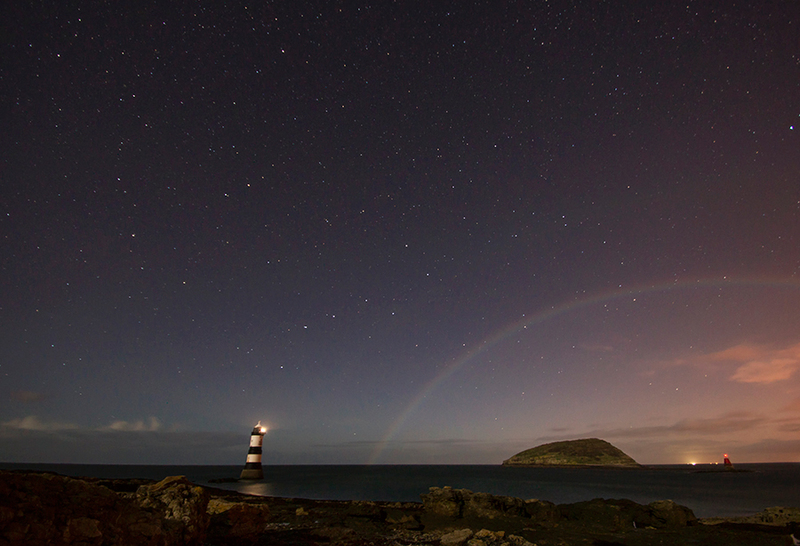 Photographer Kris Williams snapped this bow near Puffin Island off the coast of Wales. 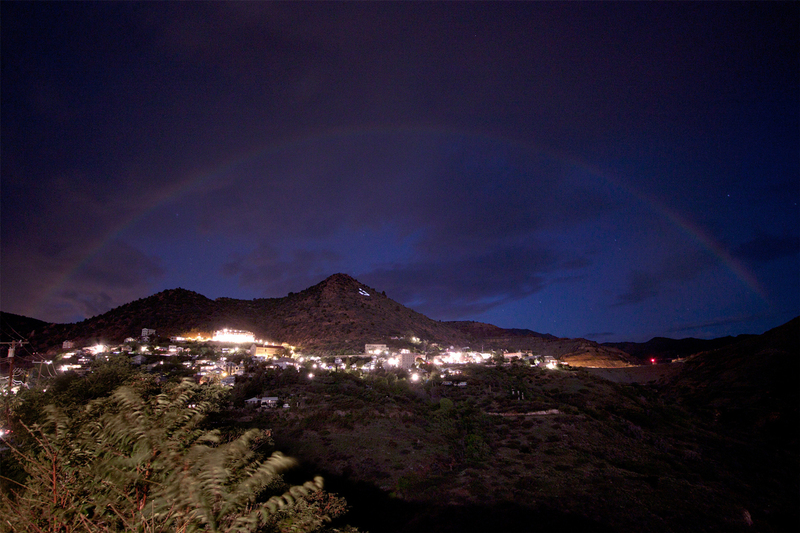 Looking for a good spot to get your own moonbow snapshot? They often form near waterfalls, as moonlight passes through the mist of water droplets, creating what's sometimes called a "spraybow". Yosemite National Park is a good bet – the rare displays can be seen there for just a few days in springtime. November is proving to be a cool month for cloud spotters - from ominous shelf clouds in Sydney to flying saucers in Cape Town. Roll clouds are a pretty rare phenomenon, so you can imagine our surprise when we spotted one outside our offices in Durban, South Africa. Swanocide: Is it the end for New York's wild swans?